Banke means ‘bent’ and ‘Bihari’ or ‘Vihari’ means ‘enjoyer’. This is how Kṛiṣhṇa, who is bent in three places, got the name “Banke Bihari”.The presiding deity of the temple is Lord Krishna. The deity was originally worshipped by Haridas Swami under the name of Kunji-bihari at Nidhivan. The idol of is much older and was worshipped in Nidhivan till 1863. Timings: 7.45 AM – 12 PM and 5.30 PM – 9.30 PM in summer, and 8.45 AM – 1 PM and 4.30 PM – 8.30 PM in winter. 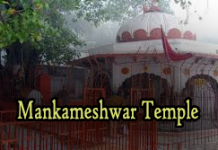 At a distance of 1 km from Vrindavan Railway Station, Sri Bankey Bihari Mandir is one of the popular Vrindavan temples situated near Radhavallabh Temple in the holy city of Vrindavan. 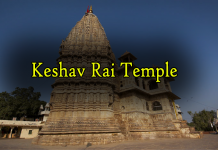 This temple is among the 7 temples of Thakur of Vrindavan including Sri Radhavallabh ji, Sri Govind Dev ji and four others. The current temple was built in 1864 by Swami Haridas of the Nimbarka Sampradaya. Later, the deity of Radha Rani was added to the temple. 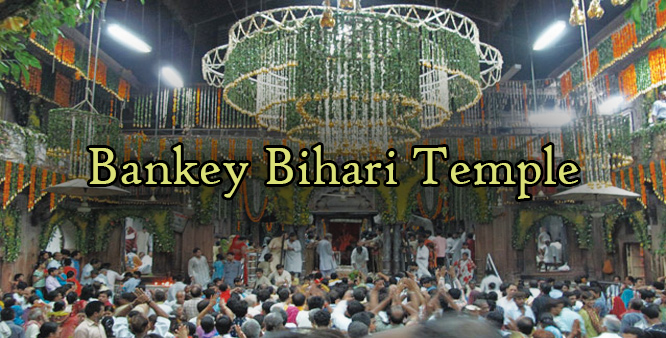 The Bankey Bihari temple is amongst the holiest and famous temples of Lord Krishna. 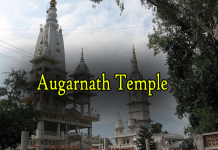 The presiding deity in the temple is of Lord Krishna standing in the Tribhanga posture. The deity is worshiped and looked after as a child. The idol is black in color and is beautifully carved. Unlike other temples, the curtains before the deity are raised and shut every few minutes. It is believed that if seen for longer time, the brilliant eyes of Bankey Bihari can make the devotees unconscious. There are no bells or conch in the temple because Bankey Bihari does not like the sound of bells or conch. The two main festivals celebrated here are Janmasthami and Holi. People from different parts of the country come here to celebrate these festivals. The other prime festival celebrated here is Jhulan Yatra, the swing festival of Lord Krishna, in which the deity is placed on beautiful silver-plated swings.